Posts: 2871 Marvelous, again hoisted on my own petard! Now I fully see just how devious Gonzo truly is. Never having looked down a male May's pants before, I didn't realize that there were two "organs of generation" per bug. Jason, I apologize abjectly and profusely. 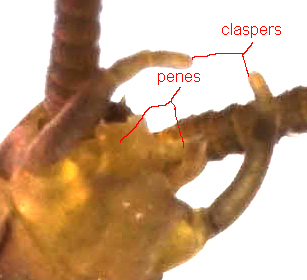 I take it in the picture that the "lobes" are the two hooks under the tails, Boy Howdy am I getting an education in the nether regions of Ephemeroptera! "Two of them thangs!" as my buddies back in Tennessee would say; now I understand why those lady Mays bob and weave so much in the spinner balls. Uh oh, I've left myself open for some kind of double entendre here. I should know better than to mess with Taxon by now; why I continue to do so baffles me endlessly. He has noted, I hope, that I at least discretely vacated the field of battle when Casey asked about Latin pronunciation a while back. I should know better than to mess with Taxon by now; why I continue to do so baffles me endlessly. He has noted, I hope, that I at least discretely vacated the field of battle when Casey asked about Latin pronunciation a while back. At the risk or responding to a purely rhetorical question, you most likely sense Taxon�s keen appreciation of your intellect, and are thus provided with adequate motivation to exercise it, or so it would seem to this observer. 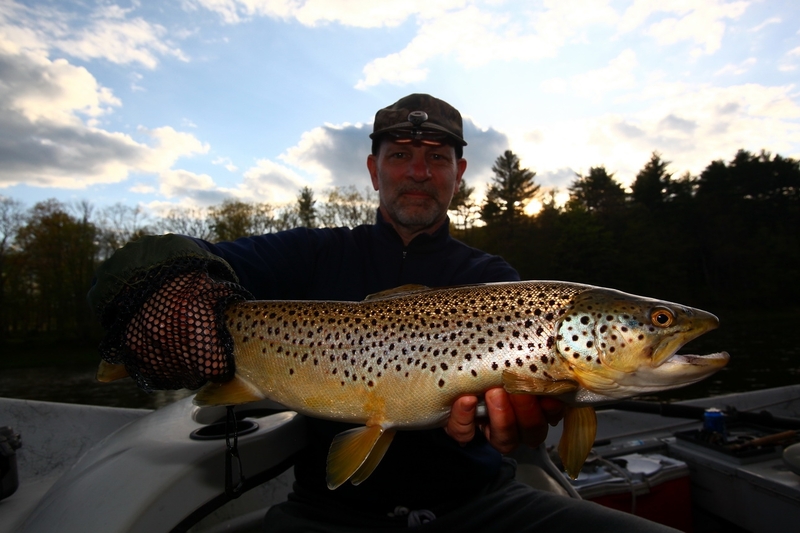 Incidentally, I attended Rick Hafele�s presentation at the Bellevue Flyfishing Show last weekend, and closely listened to him repeatedly pronounce Callibaetis as (caley-BEE-tis). This is offered, not as conclusive evidence of anything, but rather, in hope of scoring a debate point. Posts: 2871 After that most recent and very explicit photo, I know this forum should be X-rated. Jason, the Conservatives are drafting a bill at this moment to shut you down. This may seem cruel after his friendly overture, but I recommend that Taxon be banned from the site lest he drag us all down with him. Next, he'll post a photo of Trico spinners balling on a hot summer's morn. As for Rick Hafele, anyone who can make a DVD as silly as the one in his book is definitely not to be trusted. Posts: 14 Just to add or correct something I re-stated from Gonzo - I beleive the tricadatus has 3 tails which would make it very easy to distinguish them from a Quill Gordon without even considering the size difference. By the way, both of you are far beyond my English language capability. My education ended with a "D", when I told my college prof that "the only purpose of the English language was to communicate - and as long as I was communicating, I was fullfilling its only purpose". How many p. do these mayflies have? I beleive the tricadatus has 3 tails which would make it very easy to distinguish them from a Quill Gordon without even considering the size difference. Yes, Baetis tricaudatus has three tails in its nymphal form, the middle varying from about 25-75% as long as the outer two. However, it has only two tails in its winged stages. Boy, that is sure tempting, but I'll pass. regarding the taxonomic discussion, Edmunds and Allen 1964 described Rocky Mountain epeorus species. there is also a paper by someone and hilsenhoff Heptageniidae of Wisconsin that might have further species descriptions. those references are in the 1996 merritt and cummins. Posts: 77 Phew! You guys are a "painus in the assus." Posts: 2871 An instructive and funny thread on Quill Gordons for the coming season. Posts: 655 Are there people who dream about mayflies? Posts: 287 Yes, the naked females. 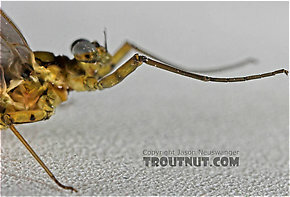 Re: White Mayfly ---- Euphron leukon?